Bhubaneswar: Prime Minister Narendra Modi on Tuesday said the development of Odisha has been stalled by the BJD government for percentage commission (PC). Addressing a rally at Baramunda ground here, he also alleged that the BJD government is being run by a coterie. “The BJD government is being run by a coterie and the State’s development has been stalled by the BJD government for PC,” he alleged. Modi urged the people to give five year to BJP to accelerate the pace of development in the state. “You believed on one person for 20 years. What did you get? The government has failed to develop the state,” said Modi. He also launched a scathing attack on BJD over the murder of BJP worker Manguli Jena in Khurda town. He accused the BJD government for rise in “goondaraj” in the State. “Our party worker Manguli Jena was murdered by BJD goons a couple of days back. There is no need to fear of such goons as we are committed to eliminate this goondaraj from Odisha,” Modi said. Modi said he is getting a feel that the people of Odisha want a change and will vote BJP to power this time for sure. 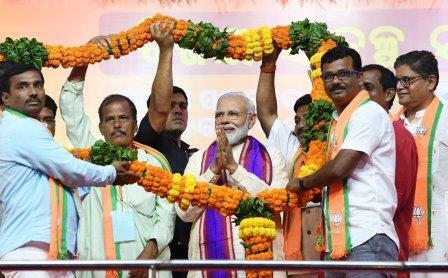 “After witnessing the enthusiasm among the people of Odisha, I can understand that they have made up their mind for a BJP government and a double engine of growth,” he added.